We live in an age where truth has become a relative term. But the Bible leaves no room for doubt when it comes to the absolute nature of truth. Unfortunately, our culture is vastly biblically illiterate. 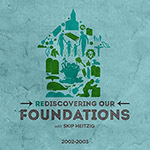 In this three-volume series, Pastor Skip Heitzig gets back to the roots of our faith, looking at what the Bible has to say about God, Christ, the Trinity, mankind, the church, heaven, and hell. Learn to stand on a firm foundation in the midst of an unstable culture.